I had a weird dream where my husband and I were driving home after a road trip, and we noticed that a broom somehow had gotten in the car. 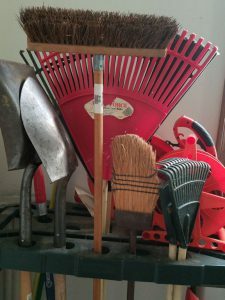 It was just an ordinary, well-used utility broom, like the sort that might be found in the garage next to the rakes and shovels. My husband wanted to turn around and take the broom back to its owners. I said that instead of wasting time and gas, we should just send them some money to buy another broom or return it the next time we were there. In real life, my husband is sensible enough that I am sure he would agree. But in the dream, he didn’t see it that way; and suddenly I felt overwhelmed by sadness like it was a horrible tragedy and the end of the world. Then I started to wake up. As the dream faded, something urged me not to forget the details—that I needed to remember. I dutifully committed this odd dream to memory, although I had no clue what profound message my subconscious mind might have wanted to communicate by way of a misplaced broom. After pondering it for a while, I decided that it had something to do with sweeping away unnecessary drama. Maybe what I need to remember is that small disruptions shouldn’t feel like the end of the world! This is a right advice for me. Thanks for sharing. Thanks Indira, glad you found it helpful!